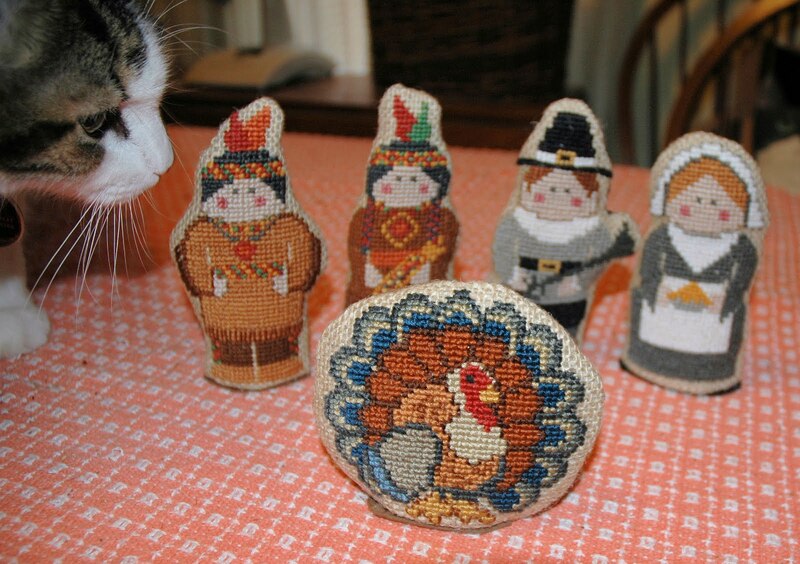 It occurred to me that I really don't have many Thanksgiving decorations. I usually rely upon natural decorations, pine cones, acorns, etc. I have always wanted to stitch something appropriate, but I was never able to get the timing right. I decided to take a break from And They Sinned, to work on these little guys. 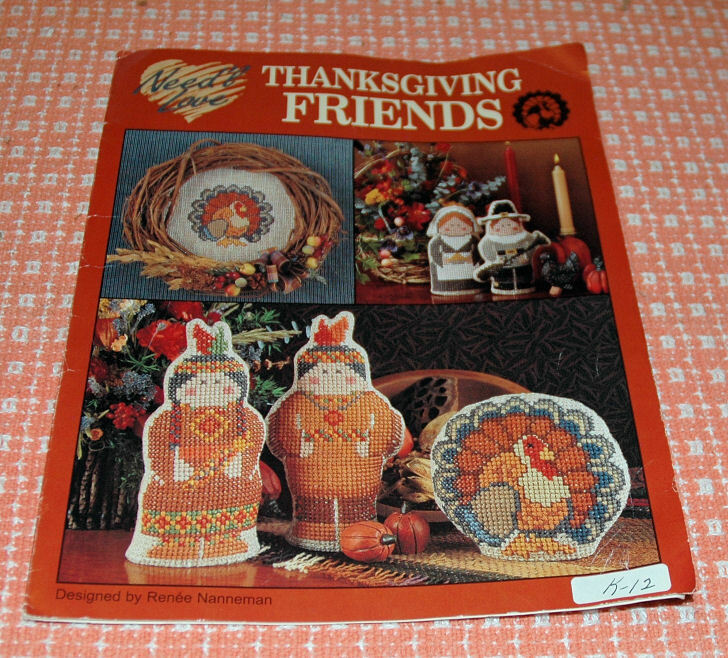 Thanksgiving Friends is a design by Need'l Love from 1989. The Pilgrim Dolls were first published in 1989 and they were so popular that it was reprinted with the Indians and turkey in 1991. The pattern called for 7 count Klostern. I only had a small piece of this which wasn't big enough. I got the idea to use a piece of burlap, which I had on hand. Admittedly, burlap is not the easiest fabric to work, but I got used to it as I went along. I like the rustic look of it for these designs. The finishing was a bit fiddly. Their size was different than the base size given, so I had to play with it a bit. Not my forte, but by trial and error, I got it to work. I sewed solid fabrics to the backs and the stands. Furrytail had to check them out of course! By the way, I wanted to give a shout out to Sharon at It's Daffycat . She will be hosting the 2012 TUSAL. Hop on over to check it out! They're so cute! Perfect for your Thanksgiving table! Those Thanksgiving friends are a blast from the past, for certain! You did a great job on them. Just saw the post. Your Thanksgiving Friends are marvelous. Love the idea of using the burlap. 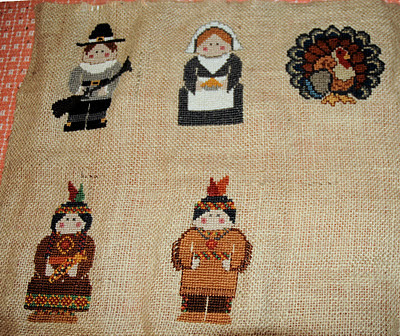 When you look at the picture of them finished, you certainly can't tell that they were stitched on burlap. You are going to have years of enjoyment for these for sure. Oh my! These are adorable! The burlap was an awesome idea and you are right the rustic look of it is great. Oh Erica, they are so sweet. Your finishing is so gorgeous, I'm not sure if I could ever do that. Congratulations!